This past weekend was all about T.J. and Mama. With Daddy away for a long weekend golfing in Phoenix…I know, poor guy…T.J. and I had big plans of playing with trains, practicing our putting strokes (on his super cool crocodile putting game), watching movies, and of course eating good food! Our Saturday started out perfectly. I’m a very early riser and was up around 6am that morning. With T.J. not waking up until around 8am, I was able to relax, enjoy my coffee, and still get a few things done before my little bundle of energy rolled out of bed. Usually when he wakes up his routine is to go sit in his chair, eat breakfast, and watch his shows (either Mickey or Meeska as he calls him or Jake and the Neverland Pirates). Today was going to be a little different, which is always exciting for a little routine-oriented guy like my T.J. I wanted to get 8 miles in on my treadmill right away so we could get cleaned up and make it to the 11:40 showing of the Lego movie. So T.J. got to have his breakfast in a bowl in front of the T.V. watching cartoons in the basement, cuddled up with his “guys” (all his favorite stuffed animals) on the recliner while Mama ran. He thought this was pretty cool. The rest of the day was so much fun. Gaga Jean (as T.J. calls my mom) met us at the Lego movie. It was so cute, and I loved the adult humor they included! After the movie we met my sister and her daughter at a favorite Mexican restaurant for a late lunch. T.J. thought he was a big shot since he was getting to skip his nap. As we enjoyed our lunch in the warm confines of the restaurant we couldn’t block out the snow, wind, and subzero temps that surrounded us outside the windows. Our original plan was to stay in town and go to 4pm mass so we could sleep in the next morning, but thinking about our long lane in the country and knowing Mike was not there to plow it out, I decided we better go home and check our driveway before deciding if we would still go to church that evening or not. As I approached our gravel road and saw the huge drift that nearly blocked our path onto it from the highway, I knew I needed to keep my fingers crossed that we could get back in our driveway. It was a good thing I came home when I did. By the time we pulled into our lane, I had to push it pretty good to get our Pathfinder through the huge drifts that were quickly covering our pathway to the house. It looked like we would be staying in for the night. Inspired by the Spinach & Artichoke Chicken I’ve made in the past, I decided to take the same recipe and top a pizza crust with it. 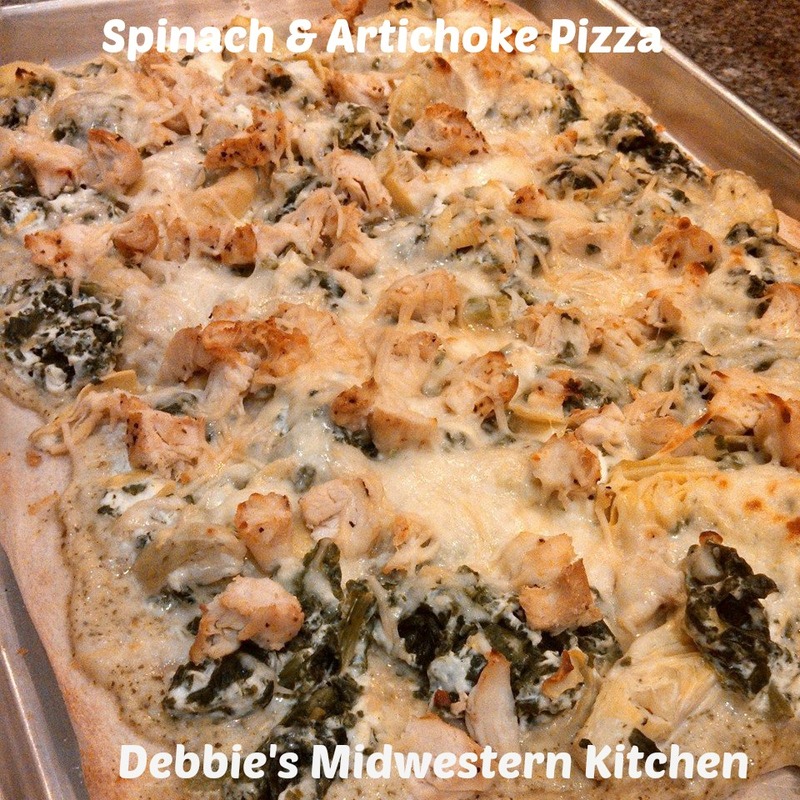 The result was Spinach & Artichoke Pizza and it was sensational. T.J. even liked it which was a huge success. Give this healthier version of pizza a try! 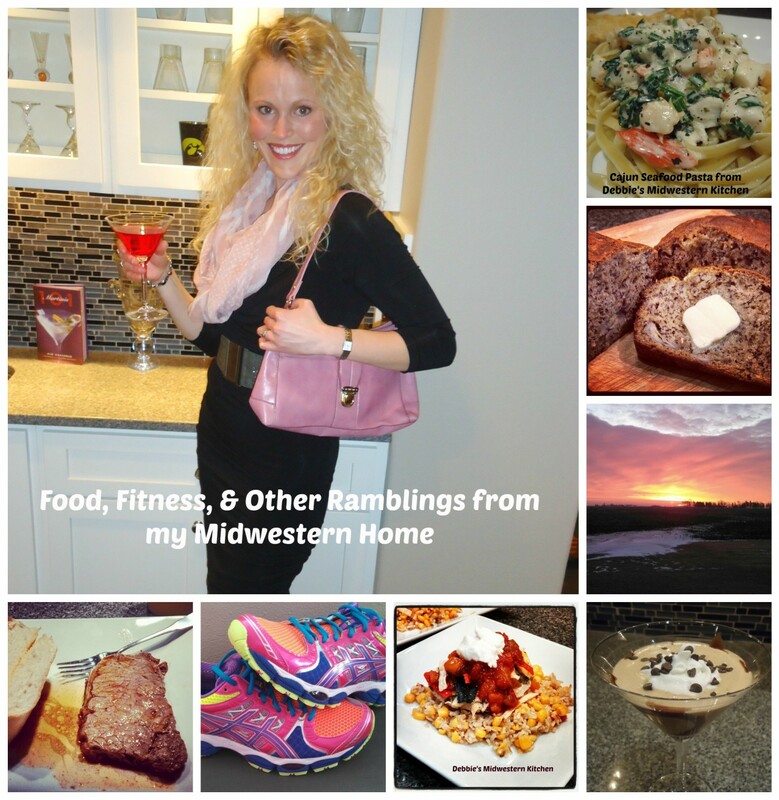 You’ll feel like you’re splurging without the guilt! To prepare chicken, place on a broiler pan (you could also grill the chicken if you’re fortunate enough to have nice weather) and season both sides to taste with steak seasoning. 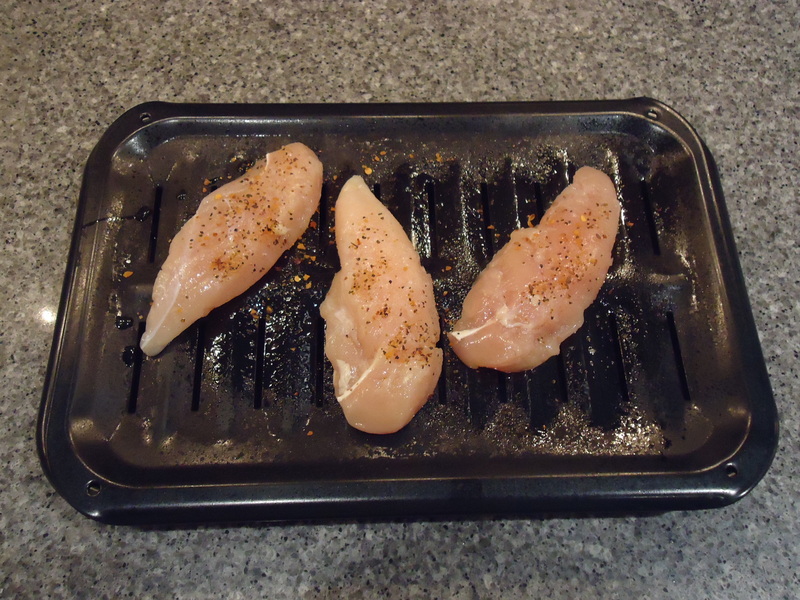 Broil on medium-high until chicken is cooked through. Remove and dice chicken into cubes. In a medium-sized mixing bowl, combine yogurt and cream cheese until smooth. 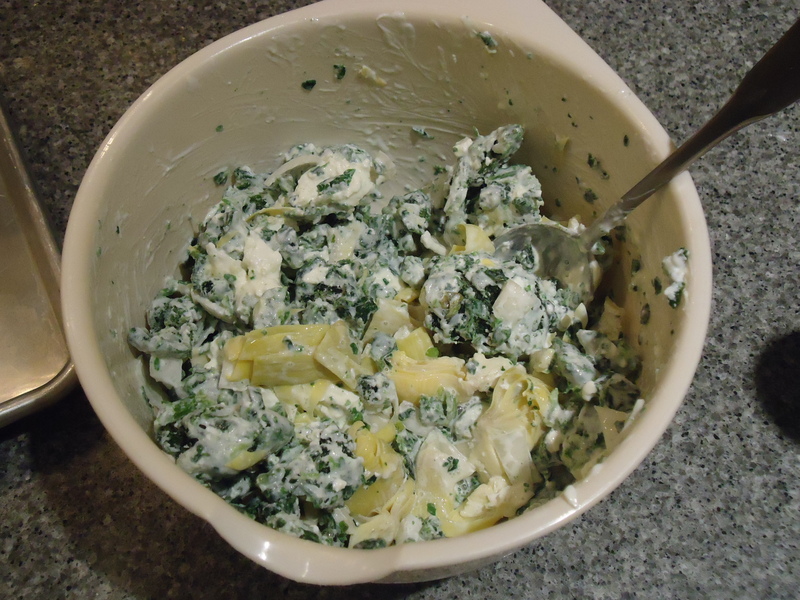 Add garlic, onion, artichokes, and spinach and stir to combine. Spray a baking pan with cooking spray and unroll pizza crust onto pan. 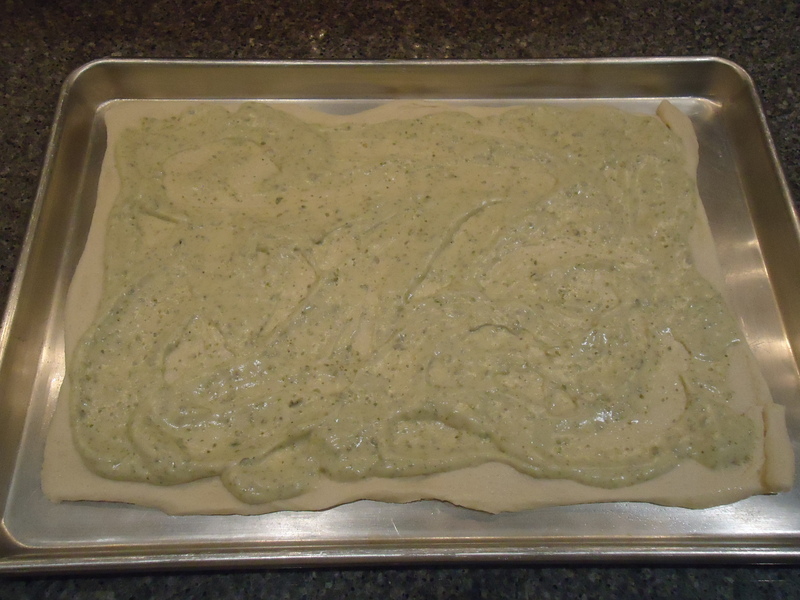 Starting in the center push down and spread dough into a large rectangle. 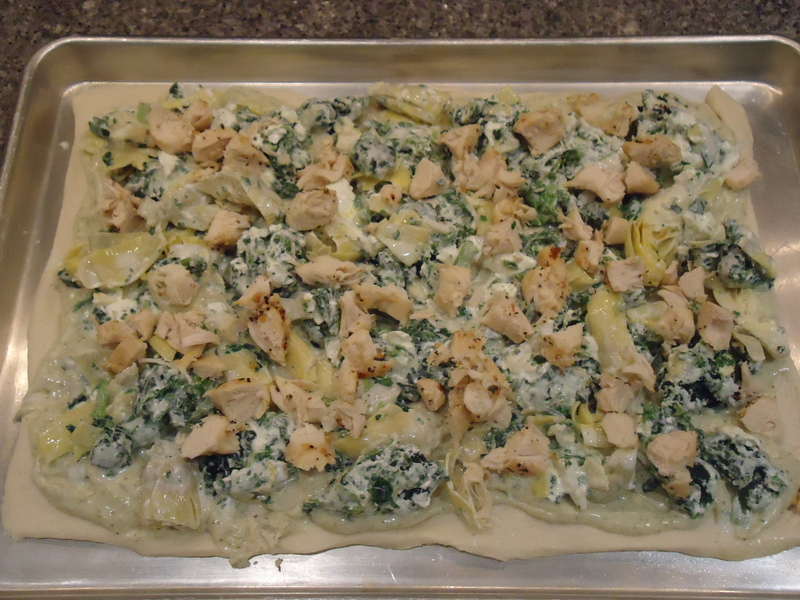 Pour cream sauce onto crust and spread over dough. I used a whole cup and thought it was a little too much so in the recipe I have reduced it to 3/4 cup. If you like a lot of sauce you can add more like I did, but with as much topping as you’ll have, you don’t need much. 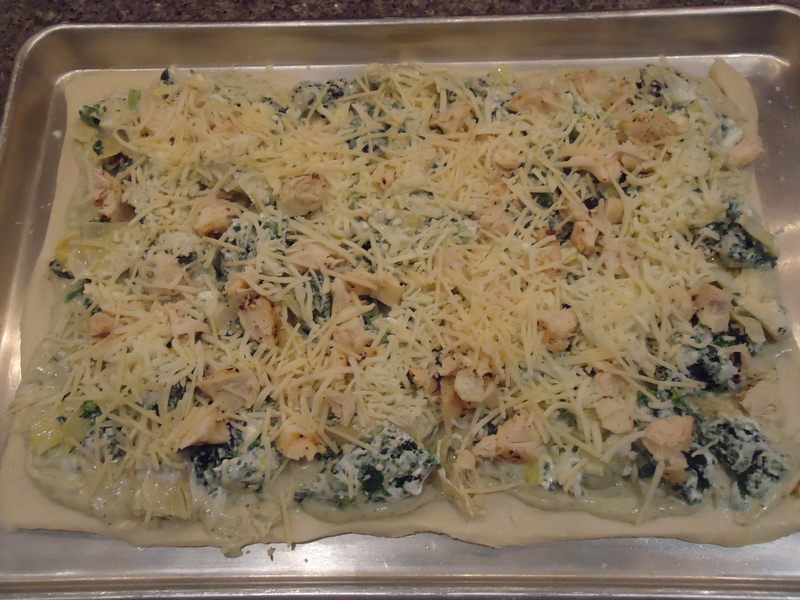 Top the sauce with spinach and artichoke mixture as evenly as possible. Top evenly with diced chicken. Sprinkle with mozzarella cheese to taste and then top it all off with a sprinkling of parmesan cheese. Bake 20-25 minutes, depending on how well you like your crust done. This pizza was delicious and hit the spot on a cold Saturday night. The best part was I felt like we were splurging while we were actually getting a meal packed with nutrient filled veggies.